This was a wonderful audiobook for children about using their imagination to calm their fears. There were two stories. In each the parent teaches the child to use her imagination to help explain away her fears. This audiobook was well produced. The narrator had a soothing voice and told the story in a way that would make any child relax before bedtime. The pace was perfect and unrushed. There were also sound effects to enhance the production. As an adult I enjoyed listening to this book so I think that children will love it. In particular I think it is good for younger children who are apprehensive about shadows and noises before bed. It is definitely a book that will help to calm their fears. I would like to thank the author/narrator/publisher for gifting me a copy of this audiobook in exchange for an honest review. All thoughts and opinions are unbiased and my own. Shadows In My Room is the story of a little girl named Kayla who is afraid of night shadows. She longs to be brave like her brother Adam, who is not afraid of anything. But for Kayla, when the sun sets and it is time to turn out the lights, that is when the scary shadow monsters come to life in her bedroom.Ms. Weaver-Clarke creates a special, nurturing relationship between Kayla and her mother, while adding in dashes of humor in the bedtime story, Shadows In My Room. For Kayla, going to sleep goes from being scary, to being creative and fun by learning the art of imagination. Kayla’s mom teaches her how to be fearless, not fearful and start to see objects through new eyes. For example: no more scary monsters live inside the closet. Instead there are angels and fairies. Now if only Mom can find a way to stop those mischievous, naughty little elves Kayla claims keep messing up her room.Linda Weaver-Clarke amps up the level of imagination to super-creative in the bedtime story, What’s That Noise?. People and some animals, especially dogs, tend to be afraid of thunderstorms. Amber is no exception to this fear. When the sky goes, “Boom!”, she wants to run and hide. Once again, Ms. Weaver-Clarke crafts a clever story packed with parental bonding, as Amber’s mother teaches her daughter to not only see the storm differently, but to also hear things through new ears. Dad gets a lesson too from Mom, when he hears the thunder clap and the wind howl. Amber and her dad learn that when the wind howls, the planets and stars are merely playing hide and go seek by hiding behind the clouds. There is nothing to fear when it storms outside, for thunderclaps are just baseballs sent flying into the sky by stars engaging in a game for fun.The illustrations in both stories are colorful with cheerful bright hues. There are thick horizontal turquoise and gray stripes featured on background of each page in Shadows In My Room. The stripes remind one of a soothing wallpaper found in a bedroom. The same striped background is seen, only sporadically this time, in What’s That Noise?. But, this time by using yellow and gold tones. The varying flaxen colors match the weather and elements of that story, like the stars and lightning. The characters themselves display accurate facial expressions during times of fear and moments of joy, particularly those moments of parental bonding.Shadows In My Room and What’s That Noise? are great bedtime stories to help children learn to overcome fears by using their imagination. The stories are unique and strong enough in teaching about imagination that they could be sold together as a unit or as two separate books. My rating: 4 starsAudiobook narrator Heidi Allred rating: 4.5 starsI listened to this book with my 7-year-old, Olsen. He enjoyed this book and will write his review below.I thought this was a fun little book, but likely would have been more fun with an illustrated copy of the book. I only have the audio.There are three short stories in this book, even though the title makes it look like two. The stories are good but I am not sure I like the third story too much. Maybe it’s just my parenting style but I was always against kids sleeping in bed with parents (and maybe it’s also me being selfish, too! ).The narrator of these stories was really good as well.Olsen’s rating: 4 starsOlsen’s review:I liked these three stories. Shadows in my room:I liked when she saw the moving tree branch. This was fun to visualize. I liked when they thought there was an elf standing in their room. That was funny.What’s the noise? :I liked when they heard the thunder. They didn’t like the thunder. It was too loud. They pretended to sit on a cloud and watch fireworks in a parade. This was fun.I’m not sleepy:I liked when he tried to make his mother keep him busy so she would get distracted and not put him to bed. I liked that he wanted to get a glass of water so it would help him not go to sleep. He wanted to sing songs with his mom. He made her get him his Teddy Bear. I would like more of these stories.-- end Olsen’s review --I received a free copy of this audiobook in exchange for an honest review. "Shadows In My Room & What's That Noise: Bedtime Stories" by Linda Weaver Clarke is a quaint duo of heartwarming children's stories for nighttime. In both of these stories, a mother helps her young daughter understand her night-time fears, including the proverbial "monster under my bed." While listening, I couldn't help but recall my own experiences as a little girl who would swear I saw ghosts in my window, when in fact it was just a shadow of the hallway light. To this day, I fondly refer to this ghost as my old friend. Linda Weaver Clarke's writing is much like that, very calming and like an old welcomed friend. To this day, I also love to sleep during thunderstorms, which is the point of the second story. Heidi Allred did a great job narrating, which contributed to my enjoyment of this book. I listened to the Audible version of this book, which is also a children's picture book. I really hope Amazon makes it a Whispersync version as my daughters used to love to listen to books while looking at pictures before they learned to read. Even though I hope this book gets the full Whispersync treatment, you don't need the picture book to enjoy it. Linda Weaver Clarke's new bedtime stories is truly a bargain...there is two stories in one book! It is an ideal book to ease bedtime fears of little ones. 'Shadows in My Room' gives a new perspective to children pertaining to those "creepy" shadows one sees at night that sometimes seems to move. It will ease fears and assist in developing a child's imagination in a positive way. 'What's That Noise' addresses the other key problem in settling little ones bedtime worries. It , again, directs the imagination in a positive manner to cease to be worried about strange noises one often hears in the quiet of the night.The first book is full of colorful illustrations depicting the flow of the story. Although the second story has good illustrations, they do not depict the story as well. I feel it needed a few more extensive illustrations to hold a child's attention. However, they were both very good helpful bedtime stories.Theses stories would be good for children ages 2 to 10.I offer Four and a Half Stars rating for the book as a whole.I was gifted a pdf of this book in exchange for an honest review , of which I have given. Two cute short stories. As you might imagine, these are intended for a very young audience. The story focuses on using your imagination in a good way instead of a negative way. The parent in the story encourages the child to envision positive images for night shapes and noises instead of negative scary images.The narrator does a good job of using different voices for the different characters. The parent sounds patient and loving. This is a sweet little book about a child that is scared at night by different noises and shadows. Her mother comes to her and explains the noises as something fun, such as the moon and the stars playing a game and lightning as fireworks to celebrate. Its basically about using your imagination and turning something scary into something fun. I listened to the audio book with my two kids who are 5- and 6-years old. I think that they were really on the outer cusp of kids who would enjoy the book (but that could also be because my kids don't have those particular fears). I think that this book would be great for a 3- to 4-year old. But regardless, I really liked the message, and really, it can be applied to adults, too. The second story is about a boy who says he's not sleepy, so he doesn't want to go to sleep. What parent and child doesn't relate to that? These were really sweet and short - perfect for a bedtime listen. 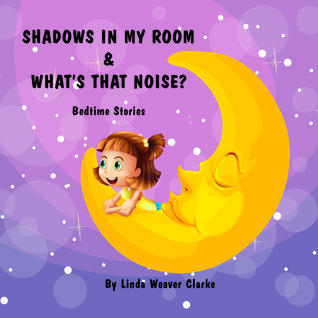 "Shadows In My Room & What's That Noise: Bedtime Stories" by Linda Weaver ClarkeThis is a children's book! I give it 5 stars, but my granddaughter who is 10 read it and gave it a c, (Tori is ten so it is geared for much younger children. The pictures were really cute! I think every little girl ( and boys as well, except the stories are about a little girl ) should have this book as part of her collection!Bedtime Stories: In each of these stories, a mother helps her little girl understand her fears at night.Shadows In My Room: Kayla sees shadows in her room that disturb her. Her mother answers all her questions about each shadow that she points to, and helps her to calm down and go to sleep.What’s That Noise: Amber hears noises that disturb her such as the wind and thunder. Her mother teaches Amber to use her imagination by turning something fearful into something fun.I was given a pfd copy by the author for a honest review! I received this book for free through Goodreads "First Reads" program. After reading it, I gave it five stars and it truly deserves that. This book is comprised of two bedtime stories. It is geared towards young children, but as a teacher, I can see these stories being read to kids from six months to about ten. Both stories offer vibrant, unique illustrations and rich vocabulary to introduce to your little learners. The first teaches kids about their imagination and guardian angels. The second teaches kids how to be brave and turn seemingly scary things into silly things. This would be a great story to read aloud to your children or students. Linda Weaver Clarke, popular author of many young adult sweet romance and mystery stories, has entered the children’s picture-book genre with her lovely new book which includes the stories, Shadows in My Room and What’s That Noise?, This darling book will help parents everywhere soothe children who have nighttime fears. Coping with strange shadows and dealing with loud thunderstorms… fears alleviated by logical and whimsical reasoning… all combine to produce a charming bedtime book for children. What a wonderful addition to the world of children’s books! This was a cute Audible book that I recently listened to. The stories last a total of about 18 minutes in length' and are stories of mother's comforting their girl's bedtime fears. I read other reviews which mentioned that there were pictures, however, I only saw the cover picture in my Audible version, unless my phone app was not working properly, which is certainly possible. The narrator was Heidi Allred. It was a sweet book which I think that my grandkids would enjoy. It is written for younger children and shows the trust between mother and child. Very nice job. These two adorable stories address children's nighttime fears. My 4 year old and I had fun reading them together and imagining how the shadows and noises in her own room could be understood. She thought the idea of the wind tickling the branches of the trees was hilarious. We enjoyed a good laugh together and I am sure any fear she had of the shadows and noises produced by the wind in the trees has been put to rest. Linda helps explain shadows and teaches how our imaginations can quiet our fears of nighttime noises. This is a great read for children and their parents to enjoy together! This is my first picture book to listen to. Not having the book to look at the pictures, I wasn't sure abut how much I would like it. But I'm happy to say that I was impressed! With the author's words and the voices of the narrator, I didn't need the book. The words flowed with emotion and fun. I look forward to more from Linda Weaver Clarke and Heidi Allred.I was given a copy of this audiobook in exchange for an honest and unbiased review. Two Bedtime Stories: In each of these stories, a mother helps her little girl understand her fears at night.Shadows In My Room: Kayla sees shadows in her room that disturb her. Her mother answers all her questions about each shadow that she points to, and helps her to calm down and go to sleep.What’s That Noise: Amber hears noises that disturb her such as the wind and thunder. Her mother teaches Amber to use her imagination by turning something fearful into something fun. Two sweet, gentle stories about overcoming fears related to bedtime. One little girl is worried about shadows in the room, the other is worried about wind and thunder. This audiobook is really useful to help young children get to sleep, especially in the car. Please note, I am reviewing the audiobook, so can't comment on illustrations. Linda Weaver Clarke - Linda Weaver Clarke travels throughout the United States, teaching a “Family Legacy Workshop,” encouraging people to write their family history and autobiography. She is the author of the historical romance series - “A Family Saga in Bear Lake, Idaho,” a mystery suspense series - “The Adventures of John and Julia Evans," and a romantic cozy mystery series - "Amelia Moore Detective Series."